Third-party applications for the iPhone and iPod touch have increasingly become part of Apple's promotional push on behalf of its mobile devices. When an ad for the iPhone or touch comes on the TV, it’s just as likely to focus on some App Store offering as it is the device on which you’d run it. Apple's spotlight on the work of iPhone app developers took on another dimension Wednesday when the company hosted a press briefing in San Francisco that showcased half-a-dozen developers and their iPhone apps—both ones that are currently shipping and ones due to arrive between now and the holidays. Why give such prominent play to third-party offerings as part of its iPhone promotional efforts? Because, explained Apple's senior director of iPhone product marketing Bob Borchers, much of the work being done by developers has been “incredibly engaging” and delivering new capabilities to the platform on a regular basis. “It shows what a fun end to end experience can look like,” Borchers said. Rolando, a platform game from ngmoco. Given the emphasis on fun, then, it’s no wonder that game makers were well-represented on Wednesday. Among the presenters was Electronic Arts, already a prolific iPhone publisher with seven apps including Scrabble, Tetris, and Spore: Origins. Patrick Gunn, marketing director for EA Mobile, showed off the $10 game Need For Speed: Undercover, slated for a December release. The racing game features what you might expect from that genre—namely a selection of muscle cars that you customize, right down to the paint job and rims. The game’s 3-D graphics looked impressive, but perhaps the most notable feature was the fact that the game’s camera tilts as you tilt the iPhone to steer—eliminating the need to tilt your head in order to keep the right perspective on the game screen. After the demo, EA also showed off other forthcoming games, specifically Monopoly and SimCity. Gameloft, another prolific iPhone game maker, was also on hand to demonstrate an upcoming release. Ferrari GT, which will let players choose from and race 33 different Ferrrari models in 10 different cities around the world, will arrive in the App Store around December 8; it will cost $10. Neil Young of Ngmoco, developer of current App Store games MazeFinger and Topple, announced that his company has 14 iPhone games in development, including five arriving in the next month. Four of Ngmoco’s holiday releases will be of the free or low-cost variety, including medical/arcade game Dr. Awesome, sci-fi actioner DropShip, PhotoBoxer, and Topple 2. The fifth game, available in mid-December for $10, is Rolando, a platform adventure game offering 36 different puzzle levels and featuring music by Mr. Scruff. Owing a lot to Sony’s LocoRoco, Of all the apps showcased Wednesday, Rolando seemed to impress attendees the most. Designed from the ground up for the iPhone, the game requires you to use the iPhone accelerometer, gestures and taps on the screen, and even finger-drawn items within the game itself in order to solve puzzles. “It’s the first platform game where you can affect the [game] environment by touch,” Young said. The newly releaset Zagat To Go '09. Wednesday's demo also featured a just-released application. Handmark Software announced that Zagat To Go ’09, a $10 directory of Zagat reviews of restaurants, nightspots, hotels and shops, is now available on the App Store. Cassidy Lackey, vice president and general manager of Handmark, told us that the app contains data for the entire U.S. as well as a few major international cities. Obviously, cities where Zagat is more popular will feature more selections. The program lets you browse for businesses near your location and view their Zagat ratings; you can also type in addresses and zip codes to look up eateries and hotels. 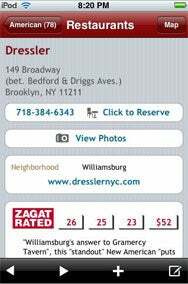 The app also connects with OpenTable, allowing users to make reservations at Zagat-reviewed eateries. The AKQA creative agency showed off forthcoming apps from two of its clients, Target and Gap. In introducing the forthcoming Target app, AKQA’s Tina Unterlaender said that the iPhone is the number-one device accessing Target’s mobile site. The new Target app provides customized gift suggestions. (What, you think Target commissioned this free app out of the spirit of holiday generosity?). Once you input the gender and age of the person you’d like to give a gift to, you can shake your iPhone to make a gift idea appear in the application’s snow-globe interface. After you’ve shaken and shaken and finally found the right gift, you can tap to add the gift to a favorites list, confirm its availability at a nearby Target, or order it from Target.com. You can even select recipients for the gift directly from the contacts stored on your iPhone. The Gap application provides an interface to six Gap Christmas Carol videos streamed over the Internet, as well as the ability to play dress-up and plop a hat, scarf, and sweater on a male or female model—and then order the products you chose from Gap, of course. Loopt CEO Sam Altman gave the press a recap of the company's free social-networking app Loopt, currently a featured app in one of those Apple TV commercials. Altman told Macworld after his presentation that the initial appearance of the Loopt-themed TV ad almost swamped his company’s servers, but that they’re now up and running and dealing with a huge influx of new users who want to share their location and personal status with nearby friends.